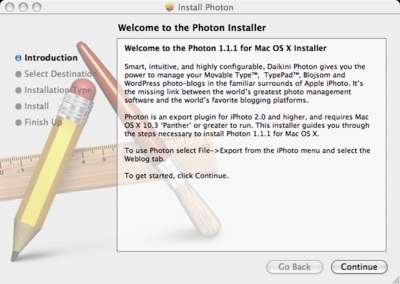 Photon, Jonathan Younger’s nice photoblogging plugin for iPhoto was released under LGPL last thursday. The tool officially supports Wordpress, MT, TypePad and Blojsom, but actually posts using the standard MetaWeblog API that Midgard also supports. 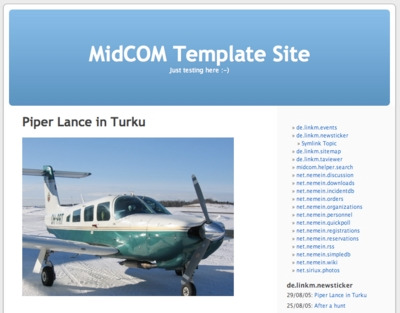 MidCOM’s blog component supports MetaWeblog API by default. The URL for it is the blog’s URL, with rpc/metaweblog/. So in my case when the blog URL is http://bergie.iki.fi/blog/, the RPC URL is http://bergie.iki.fi/blog/rpc/metaweblog/. 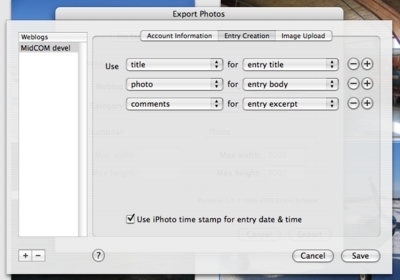 Photo’s settings can be found in the Share menu item in iPhoto. 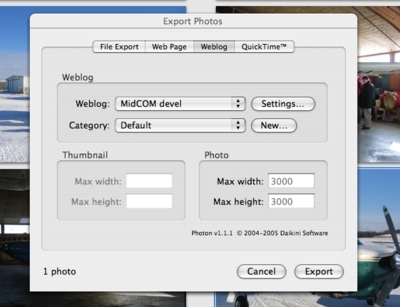 In addition to the regular items like File Export and Web Page, there should be a new Weblog tab. Here you should select the Weblog Settings… to add your Midgard-powered blog into the list. Unfortunately since Midgard is not yet an officially supported blogging system in Photon, the Autodiscover feature does not work an so you need to input your blog’s information manually. Blog ID doesn’t matter with Midgard, but the Access Point should point to your blog’s RPC URL. Select Blojsom as the Platform, as that makes Photon use standard MetaWeblog API instead of Movable Type API. 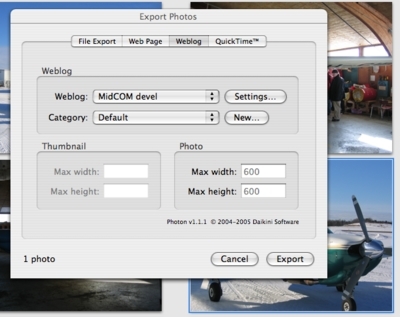 While this is already nice, it would be even nicer to be able to add Photon support into MidCOM’s photo gallery component. Since Photon source is now open and it is easy to see what it actually does this should be fairly simple and require only porting the MetaWeblog handlers from newsticker. Thanks to Daikini Software for Open Sourcing this great tool!